Carry more and make fewer trips with this extended height hand truck. The foot kick gives you extra leverage on heavy loads when starting. 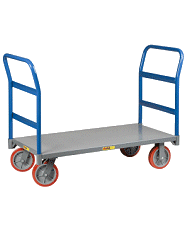 Simply tilt the hand truck back while using your foot to push the base forward. You will be amazed how much easier it is to start out. Frame stands 60” tall. The large 13-1/2” deep x 1/4” thick nose plate with tapered front edge measures 16” at the base. Frame is made from 1.05” diameter 14 gauge steel tubing and is fully welded for strength and rigidity. Wheel guards protect the wheels from the load. Great Product. Bought because of the height and large platform. Both very important to our needs. The only problem so far is that the leading edge of the platform needs to be sharpened. As it arrived the leading edge is about 3/16 to the top from the floor. This makes it impossible to insert it under a stack of boxes without smashing the bottom box.